The more complicated reason for the Herberts’ worry, however, is that the property provides a unique and somewhat mysterious advantage to their business, Riverbend Gardens. Here, the land allows the couple to plant crops of vegetables and bedding plants two to three weeks earlier than their local competitors. Riverbend Gardens’ lettuce and spinach hits the farmers’ markets by June, and carrots and potatoes by early July. U-pick saskatoons are ready just a couple weeks later. Sweet corn matures here at the same time as in Taber. Often, they’ll even manage a late fall crop of watermelon. That’s why they are fighting to reroute the roadway, which may pass through their land within the next decade as part of the City’s plans to transform the now rural area into neighbourhoods for the expanding northeast. 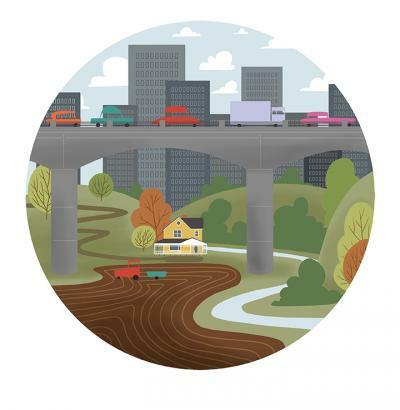 For Janelle, however, this has become as much a matter of cultivating coexistence for urban agriculture and urban growth as it is of protecting the house, farm buildings and irrigation system that, on proposed maps, lie beneath asphalt. “When are people going to wake up and say we need to preserve some land?” she asks. In this part of the city — a pie slice bordered by Manning Drive, the Anthony Henday and the river — the tension dates back to the early 1980s, when Janelle’s parents used the land for vegetables (her grandparents had it before them, but had both crops and hogs). Not exactly annexed for future growth, the land “was given to Edmonton [by the province] to say ‘quit asking to annex St. Albert and Sherwood Park,’” says Councillor Ed Gibbons, whose ward encompasses the region, known as Horse Hill, which was named for its role in boarding horses once used to protect Fort Edmonton. Today, he and Janelle manage a seasonal staff of about 12 people to grow bedding plants and nearly two dozen varieties of vegetables — everything from purple potatoes, to pumpkins, to that sweet corn that rivals Taber’s, thanks to the extra weeks Riverbend Gardens gets in its season. They’re within easy access of the eight farmers’ markets they serve and have recently started supplying customers with weekly boxes of fresh produce. It all adds up to an income and standard of living on par with the Herberts’ friends in the city. “When you have an asset like those food producers with that kind of land and soil,” Walters says, “It gives you opportunities as a city to think bigger.” That is, find ways to keep farms like Riverbend Gardens within the city limits, particularly if they contribute to the local food economy (the Herberts, incidentally, are among the minority in this region that do). But as part of the committee that completed the urban agriculture strategy, GEA member Debbie Hubbard was disappointed by its lack of guidelines for land-use decisions. She feels the document was rushed to allow Horse Hill development plans to be quickly approved, which happened this past February (only three councillors opposed it; Gibbons wasn’t among them). “I think what citizens wanted was that same imagination that [the City] had with the river valley. And now it’s a legacy,” says Hubbard. Janelle isn’t against developing the area. Ideally, she’d like to see what Walters advises: the farms sectioned off along the river into their own neighbourhood, rather than divided into neighbourhoods governed by residential and commercial zoning as plans dictate. But she may be hard pressed to deny the potential market advantages of the Horse Hill plan — provided the highway is relocated. If things unfold as predicted by Jerry Bouma, a consultant who worked with Walton International Group, a Horse Hill developer and majority landowner, the future could be fruitful for Riverbend Gardens. “The plan is to create an atmosphere that really embraces that dimension,” he says of local agriculture. Market gardens would help define the culture of the new town, where greenhouses might stand in for strip malls. Whether they stand in the way of progress, or represent a version we struggle to recognize, they’ll keep fighting regardless of how futile it may prove. If nothing else, the prettiness of their place may one day lend itself to a sense of poignancy. That may be a cold comfort, but, if he has to, Aaron, for one, will take it.